SermonAudio.com | SermonAudio Tip: Affordable Church App for iPhone + iPad + Android! 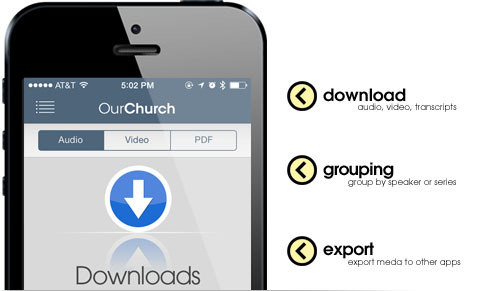 Affordable Church App for iPhone + iPad + Android! Here at SermonAudio, our passion is to help get great teaching and preaching material to a wider listening audience. And so we're always exploring new and innovative ways to deliver sermons to where people are today -- effectively and economically. Whether it be PCs, Macs, mobile phones, tablets, Kindles, or TVs. We've got you covered. With that in mind, we're excited to announce our newest service exclusively to broadcasters on SermonAudio -- the Church App for either iOS or Android! A fully-functional, and completely affordable native app that's budgeted for ministries of any size. Now available for iPhone, iPad, iPod Touch, and Android phones + tablets. New! Native iOS8 Support! For version 3.1, all church apps have been refreshed to be compatible with iOS8 and the larger screen sizes of the iPhone 6/6 Plus. The sermon playback speed is now adjustable. In-app background playback is now supported. Downloading videos, Chromecast support, search auto-complete, and more! New! Android Church Apps! Version 1.5 introduces support for Google Chromecast, a more robust audio player, audio player controls in the player notification, podcast links which can be opened in your favorite Android podcasting app, and numerous fixes to improve stability. Android Church Apps! 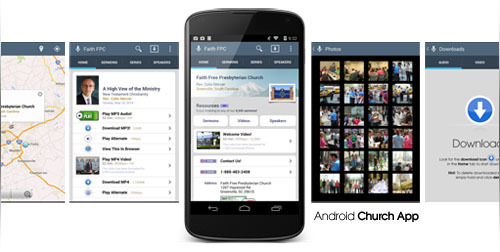 We now support Church Apps for the Android platform in both phone + tablet form factors! 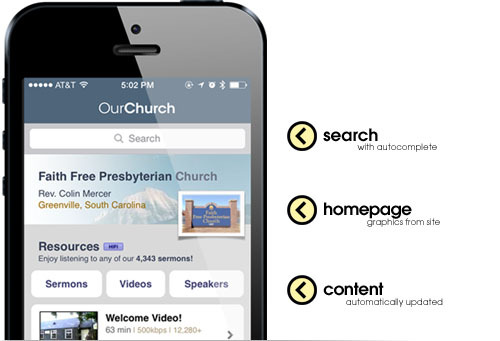 Please note that the Android version is a separate option from the current iOS Church App. Refer to the Members Only Area for more information on activating either the iOS or Android options. All screenshots below are taken from the iOS Church App. The Android Church App will have very similar screens and functions. What is it exactly? 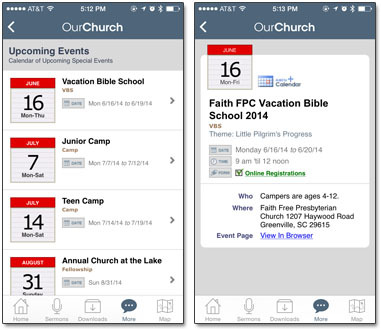 The Church App makes it easy and economical for your church to have its own custom iPhone or Android app. Your own icon, your own name, your own listing in the App Store, your own sermons, photos, blog, and more! How easy is it to setup? Real easy. In fact, you simply need to turn the option ON and we take care of the rest, from assembling the graphics, compiling the code, and of course submitting it to the App Store. Entire turnaround time: 7 to 14 days! Access to all your sermons, not just newest. 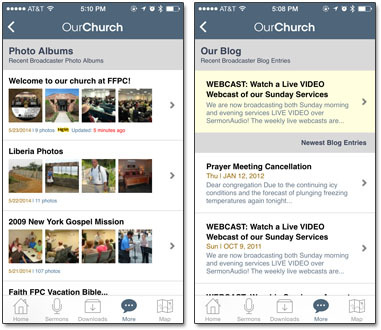 If you broadcast with us, it makes sense to let us create your Church App. All of your sermons are here already. The Church App gives mobile users access to all of them! Browse or search through audio, video, transcripts by date, by series, by Bible, keyword, or user comments. Search with auto-complete to quickly find speakers or sermon series. Download Sermons! 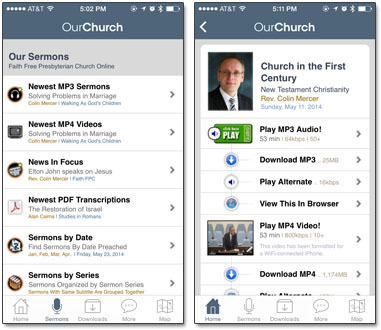 You can easily download multiple sermons directly to your mobile device for offline listening! It's perfect for when you need to "load up" on sermons at a coffee shop while on the road. MP3, MP4, and PDF downloads are supported with grouping. iOS and Android includes differing abilities to export to other apps. Special Events Integration! The Church App also supports integration with the upcoming special events found on your SermonAudio account. Use the "Add to Calendar" button to conveniently add the event to your phone's Calendar App! New! Online Donation Integration! 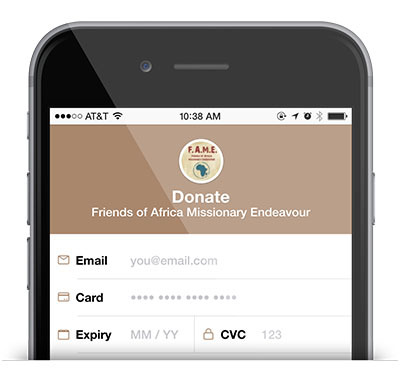 The Church App also supports online donations in a beautiful, mobile-friendly interface. Activate donations on your SermonAudio account, and it's automatically activated on your Church App! New! Native Support for both iOS + Android platforms! New! Looks great in both phone + tablet form factors! New! Download MP3, MP4, PDF sermons for offline enjoyment! New! Auto-complete in search bar for speaker names + series. New! Audio player shows sermon info + album art. New! Online donation support -- mobile-friendly! Remembers the last play position for every sermon and auto-resumes. Robust audio streaming experience and background playback. Browse, search, and stream AUDIO sermons! Browse, search, and stream VIDEO sermons! Browse, search, and read PDF transcripts! Browse sermons by BIBLE reference. Book, chapter, verse..
Browse by the SPEAKER name. By DATE Preached: January, February, March..
By Sermon SERIES (recent show first). By EVENT Category: Audio Books, Weddings, Q&A, Funerals..
Browse through our recommended picks. Browse all sermons with user COMMENTS. Read Spurgeon's Morning & Evening devotional. Link to your church's own external website. Easily find the church using your GPS with our interactive map! Special! Video streaming over 4G, WIFI with selectable bitrate. Special! Live video webcasting with selectable bitrate! Special! Photo albums! Browse recent albums in portrait and landscape! Special! Add user comments directly to sermons or blogs! Special! Blog and Twitter! Keep up with latest news. Special! Events Integration! Display special upcoming events. Special! eDoc Articles! Access your church's electronic documents! $199 $99 (sale) one-time setup +$10 per month. This is simply the fastest and most affordable way for any ministry to get their own native iPhone or Android app. Research for yourself and compare our costs with other services! For more information about requesting activation of this option, please log into the Members Area and take a look in the "Personal Info" section. The IOS app will be very useful for those who are supposed to have that and by that we can see that many apps are coming out and the apps are also useful for many other things as well. "Anyone have any issues with the iPhone app playing videos upside down? If so, how do I fix it?" Assuming that you don't have your phone's orientation locked, you can flip them in iMovie, but if you don't have the app stock on your phone, you can download "Rotate Video & Flip" or "Video Rotate Free" both free apps within the iTunes store. Not sure why that happens at times. A video can be recorded fine, but when uploaded, plays upside down. Anyone have any issues with the iPhone app playing videos upside down? If so, how do I fix it? Here you can get download & installation steps of NetCut for Android users. not figured it out, it cost money for people to put the app together and disseminate it. Do you work for free? 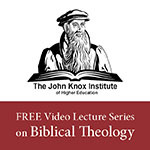 An interesting sermon re: conferences and what they are charging to hear the 'rock star' preachers of modern calvinism (the big names), but why isn't it free to hear the preaching of God's word. Can the app inform constituents about event cancellations, postponements, church news updates, too? 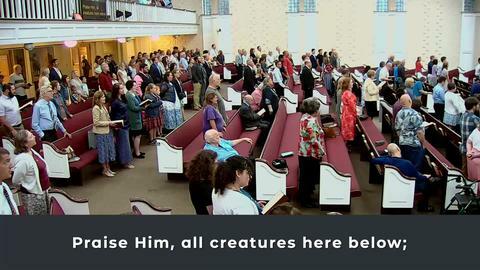 Do you have a video clip demonstrating the usefulness of custom made SermonAudio.com apps? I'm talking about the Sermons app. Sorry for not specifying that in the first one! Are you planning on adding post histories to the Android app? It would be really great if you did! Yes you do ... Don't you believe in the suffeciency of scripture? Excuse me Sermon Audio, I know you guys are busy and I don't mean to bother you but can I ask a real quick question? Excuse me SermonAudio Staff, I just wanted to drop a note saying thank you for the wonderful app, these sermons have been a very rich blessing. That and I know this isn't part of the news post, but what criteria must a sermon fit in order to be a staff pick? (I was just wondering because I have heard some really good sermons and I'm left scratching my head wondering why they aren't chosen) Thank you! We don't mind feedback. Really, it's quite alright. If you email us sermons that have been a blessing to you and recommend it to us for a staff pick, we'll do our best to listen to them and make the final call. Thank you! If I seemed proud or presumptuous I sincerely apologize. I'd just always wondered that's all.